The preceding description of stellar evolution is based on calculations. However, no star completes its main-sequence lifetime or its evolution to a red giant quickly enough for us to observe these structural changes as they happen. Fortunately, nature has provided us with an indirect way to test our calculations. Instead of observing the evolution of a single star, we can look at a group or cluster of stars. We look for a group of stars that is very close together in space, held together by gravity, often moving around a common center. Then it is reasonable to assume that the individual stars in the group all formed at nearly the same time, from the same cloud, and with the same composition. We expect that these stars will differ only in mass. And their masses determine how quickly they go through each stage of their lives. Since stars with higher masses evolve more quickly, we can find clusters in which massive stars have already completed their main-sequence phase of evolution and become red giants, while stars of lower mass in the same cluster are still on the main sequence, or even—if the cluster is very young—undergoing pre-main-sequence gravitational contraction. We can see many stages of stellar evolution among the members of a single cluster, and we can see whether our models can explain why the H–R diagrams of clusters of different ages look the way they do. The three basic types of clusters astronomers have discovered are globular clusters, open clusters, and stellar associations. Their properties are summarized in Table 1. As we will see in the next section of this chapter, globular clusters contain only very old stars, whereas open clusters and associations contain young stars. Globular clusters were given this name because they are nearly symmetrical round systems of, typically, hundreds of thousands of stars. The most massive globular cluster in our own Galaxy is Omega Centauri, which is about 16,000 light-years away and contains several million stars (Figure 1). Note that the brightest stars in this cluster, which are red giants that have already completed the main-sequence phase of their evolution, are red-orange in color. These stars have typical surface temperatures around 4000 K. As we will see, globular clusters are among the oldest parts of our Milky Way Galaxy. Open clusters are found in the disk of the Galaxy. They have a range of ages, some as old as, or even older than, our Sun. The youngest open clusters are still associated with the interstellar matter from which they formed. 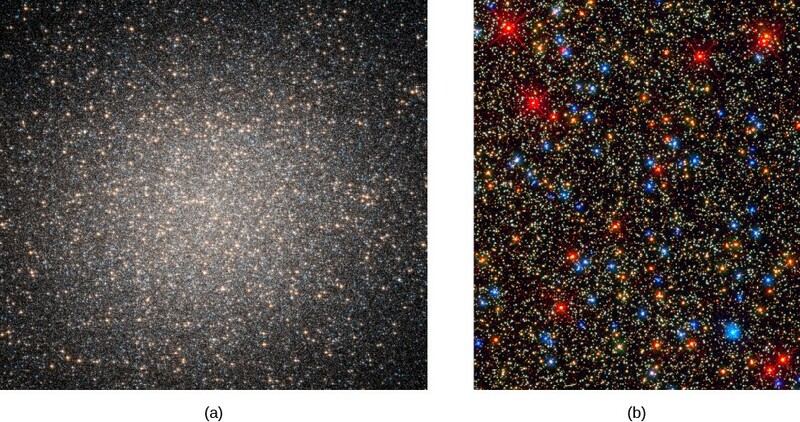 Open clusters are smaller than globular clusters, usually having diameters of less than 30 light-years, and they typically contain only several dozen to several hundreds of stars (Figure 2). The stars in open clusters usually appear well separated from one another, even in the central regions, which explains why they are called “open.” Our Galaxy contains thousands of open clusters, but we can see only a small fraction of them. Interstellar dust, which is also concentrated in the disk, dims the light of more distant clusters so much that they are undetectable. Although the individual stars in an open cluster can survive for billions of years, they typically remain together as a cluster for only a few million years, or at most, a few hundred million years. There are several reasons for this. In small open clusters, the average speed of the member stars within the cluster may be higher than the cluster’s escape velocity, and the stars will gradually “evaporate” from the cluster. Close encounters of member stars may also increase the velocity of one of the members beyond the escape velocity. Every few hundred million years or so, the cluster may have a close encounter with a giant molecular cloud, and the gravitational force exerted by the cloud may tear the cluster apart. An association is a group of extremely young stars, typically containing 5 to 50 hot, bright O and B stars scattered over a region of space some 100–500 light-years in diameter. As an example, most of the stars in the constellation Orion form one of the nearest stellar associations. Associations also contain hundreds to thousands of low-mass stars, but these are much fainter and less conspicuous. The presence of really hot, luminous stars indicates that star formation in the association has occurred in the last million years or so. Since O stars go through their entire lives in only about a million years, they would not still be around unless star formation has occurred recently. It is therefore not surprising that associations are found in regions rich in the gas and dust required to form new stars. It’s like a brand new building still surrounded by some of the construction materials used to build it and with the landscape still showing signs of construction. On the other hand, because associations, like ordinary open clusters, lie in regions occupied by dusty interstellar matter, many are hidden from our view.